Funded by the Rural Futures Institute, HealthVoiceVision is a combined Photovoice (PV) and survey research project that links community voices/images with rigorous social science research methods to provide more insight into the health of rural communities. This project addresses an important gap in our understanding of local health ways by providing data at sub-county, community specific levels. 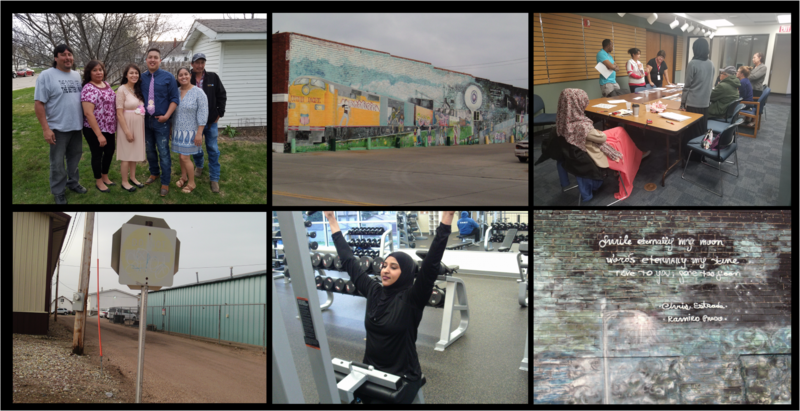 The creation of a cost-effective and accurate means for uncovering health inequalities in rapidly changing, ethnically diverse small communities in the Midwest will lead the way to more accurate health interventions within these communities. Photovoice study – a community-generated art/advocacy photo-documentary project. A 325 household survey on social determinants and well-being. Revamping the high school health curriculum into a processed-based learning experience where students present public health campaigns at community health fairs now held on their campus bi-annually. A variety of qualitative interviews on minority health disparities conducted over the past two years. The exhibition component consists of two art installations: (1) Refocusing Agriculture, Immigration & Our Well-being; and (2) “Ask a Doctor?” UNL Health Voice Vision & Looking Past Skin is funded by design to be independent or complementary depending on the venue. For more information on Health Voice Vision or Looking Past Skin, please contact Kim Gocchi Carrasco.